Derek McInnes says he and his Aberdeen players have the belief that they can now push Celtic all the way in the race to become Premiership champions. 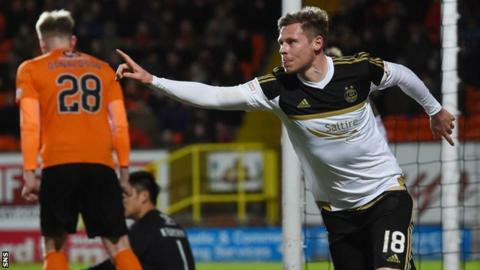 The second-top Dons narrowed the gap at the top to four points by beating Dundee United 1-0 at Tannadice as Celtic were held at home by Dundee. "I believe we can win enough games to make it exciting enough." manager McInnes told BBC Scotland. "We came out and made sure we got the reward for our dominance tonight." Aberdeen's position would have been even better had they not dropped points to Inverness Caledonian Thistle and St Johnstone in their two previous games. But McInnes said: "I'm always encouraged by my team and always confident when the game comes round we can win it. "For us to try and even force the issue with 10 games to go, we have to make sure there is no sloppiness, no room for error and keep winning games." McInnes was sent to the stand after protesting about a goal disallowed in the first half by referee Bobby Madden. The manager has apologised for his outburst at the officials but maintains the goal should have stood. "I was probably a bit too animated with what I said to the fourth official and I have apologised to him for my part in it," said McInnes. "For me, there is nothing wrong with it, but obviously the referee has felt there was. "He has obviously felt that Graeme Shinnie has made the most of it and maybe jumped into the challenge. "For me, it was clear. I actually thought at the start the referee was pulling it back to award us a penalty, which I was annoyed about at the time. "But then I realised he was going to book Graeme, who I thought had been fouled in the box." United missed out on a third straight victory and remain eight points adrift at the bottom of the table, but manager Mixu Paatelainen believes they still have a realistic chance of avoiding the drop with 10 games left to play. "I thought our performance merited a draw, although I don't think we started as well as Aberdeen," he said. "They were certainly quick off the mark, but second half we certainly had chances to score and we should have scored and maybe a draw would have been a fair result. "But, you know, it's not a fair game and we were beaten." Paatelainen was disappointed with his team's overall performance but retains faith in his squad. "I thought we were a little bit off it," he added. "I thought our passing game was nowhere near what it should have been and also the chances we created we should have been much sharper in those situations. "All credit to the players, though, there was a real fight there and they did everything tonight, but unfortunately it wasn't enough."